Here's a tester intended to test the "list" command of extfs helpers. I provide with it tests for uzip, urar, uzoo, and lslR. That's to demonstrate the power of the tester. If this tester gets merged into MC I'll provide tests for more helpers (anybody could, though; it's very easy). The dire problem of us not currently having tests for covering extfs has been mentioned several times here. The tester works by feeding the helpers example input, parsing their output and comparing it to the known correct output. See the ​README (html format). See the ​data directory. The purpose of the '.input' and '.output' files should be self evident even if you don't read the docs. As you'll shortly see, each helper needs a very minor modification to make it possible to feed it "fake" input. 3730-0001-extfs-introduce-a-command-line-tool-for-parsing-file-lists.patch​ (15.0 KB) - added by mooffie 2 years ago. 3730-0002-extfs-introduce-a-tester.patch​ (15.6 KB) - added by mooffie 2 years ago. 3730-0003-extfs-documentation-for-the-tester.patch​ (7.6 KB) - added by mooffie 2 years ago. 3730-0004-extfs-uzoo-make-it-testable.patch​ (866 bytes) - added by mooffie 2 years ago. 3730-0005-extfs-uzoo-add-tests.patch​ (5.2 KB) - added by mooffie 2 years ago. 3730-0006-extfs-uzip-make-it-testable.patch​ (971 bytes) - added by mooffie 2 years ago. 3730-0007-extfs-uzip-add-tests.patch​ (17.8 KB) - added by mooffie 2 years ago. 3730-0008-extfs-urar-make-it-testable.patch​ (858 bytes) - added by mooffie 2 years ago. 3730-0009-extfs-urar-add-tests.patch​ (9.2 KB) - added by mooffie 2 years ago. 3730-0010-extfs-lslR-make-it-testable.patch​ (645 bytes) - added by mooffie 2 years ago. 3730-0011-extfs-lslR-add-tests.patch​ (8.6 KB) - added by mooffie 2 years ago. 3730-0012-fixup-extfs-uzip-make-it-testable.patch​ (974 bytes) - added by mooffie 2 years ago. 3730-0013-extfs-dont-run-tester-on-make-check-if-disabled.patch​ (800 bytes) - added by mooffie 2 years ago. 3730-0014-extfs-urar-dont-invoke-rar-when-running-under-the-tester.patch​ (1.4 KB) - added by mooffie 2 years ago. Yeah, I know the masses are clamoring for FISH tests. At the moment I'm not too familiar with the FISH scripts and I want to leave that out of this ticket. A few words about "integration tests" vs "unit tests": There's another method to do testing, if MC had scripting support. That method lets us discover many bugs in the VFS, even bugs we didn't intend to cover. But, as Yury explains there, those are "integration tests", and as such they have a drawback: they don't give us the direct control "unit tests" give us on the input each component is fed. I.e., in our case we need to feed a helper various inputs, not just the input our system provides, and unit tests are better for this. (In #3729) It will be very easy to fix these once we have #3730 in. The helper 'uzip' produced no output for this input. Something is wrong. Make sure this helper supports testability: that it uses $MC_TEST_EXTFS_LIST_CMD. Oooh, yes, I made a silly mistake in 'uzip'. Too much shell scripting made me forget Perl has different rules about what's true and what's false. Here's a patch to fix this. What you've done here is truly amazing, and I was meaning to write something encouraging for a few weeks already, but, very unfortunately, I've been kept more busy than ever due to infrastructure problems with a few other OSS projects which needed to be urgently dealt with before it's too late. The latter looks *very* neat if you ask me, but on the con side, it seems it's not very well maintained, which is sad. Not sure if you know better ones, this one is the best I've stumbled upon so far. I think one problem that we currently have with the test suite, is that the test reports are buried in the logs and can't be visually inspected in a great way. 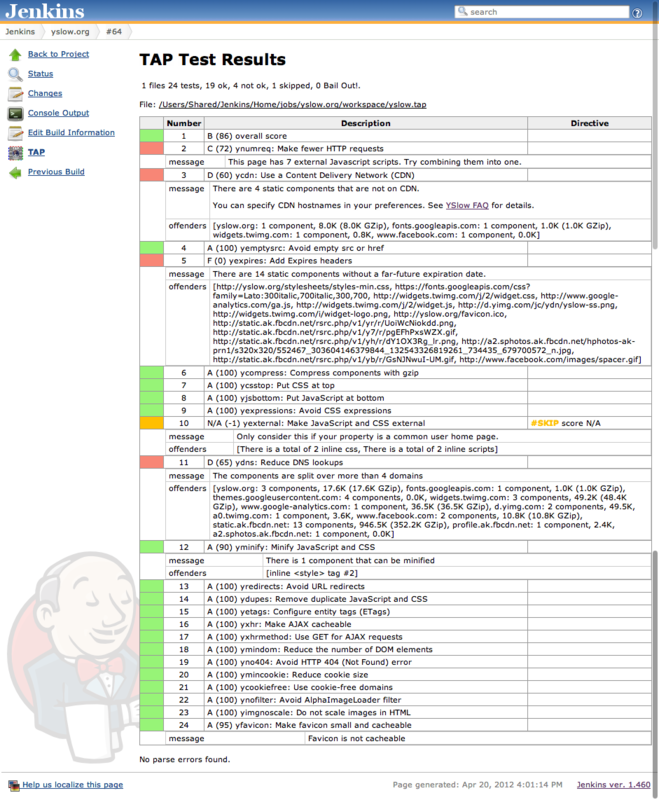 Check this out for instance: ​http://i.imgur.com/K2WK3.png & the web is full of Jenkins Test Result / TAP / JUnit report screenshots. Thanks once again for tackling this long standing pain point, and cheers for some great code written for that purpose! Here's a patch to fix this. 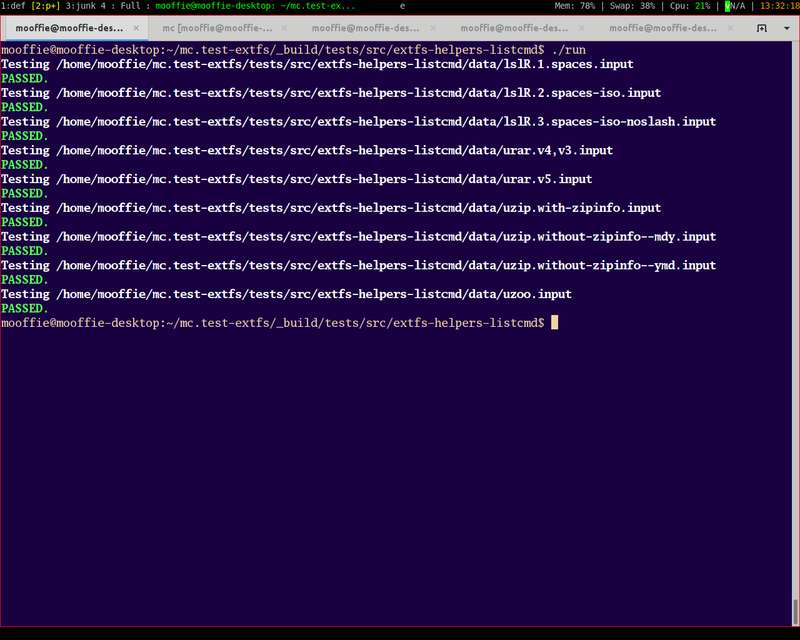 I moved the tester from tests/src/extfs-helpers-listcmd into tests/src/vfs/extfs/helpers in order to make tests/ tree consistent with src/ one. @Yury: Thanks for the info-laden comment, it's much appreciated. Lots of juicy pointers in it. Instead of doing "TEST = test_uzip test_urar test_lslr test_hp48 ..." (for example) in the Makefile, I did "TEST = test_all" (actually "TEST = run"). It's not because I eschewed integration with Autotools but because the 1st approach, since it requires us to manage more files and register things explicitly, looked, to me, a somewhat substantial bother (one might say it goes against ideas like "zero configuration" and "don't repeat yourself"). (A) Recording the behavior of, and misc knowledge about, the various extfs helpers. This is done in the 'data' dir. This is the part where our investment goes. And this part is essentially independent of whatever test harness/technique we'll eventually settle on. (B) Writing the execution engine. It's basically 20 lines of shell script (that are bloated to many more lines because of useful help messages and some such). This part gives out a "fireworks" impression (colorful output and such). But contrary to this impression, there isn't much invested here. This test_all script that I propose doesn't at all commit us to a certain path. I don't have sentiments about it (except, perhaps, to the "test autodetection" idea it implements), and I don't mind switching it (or augmenting it) with some other tool/technique. Sounds good. 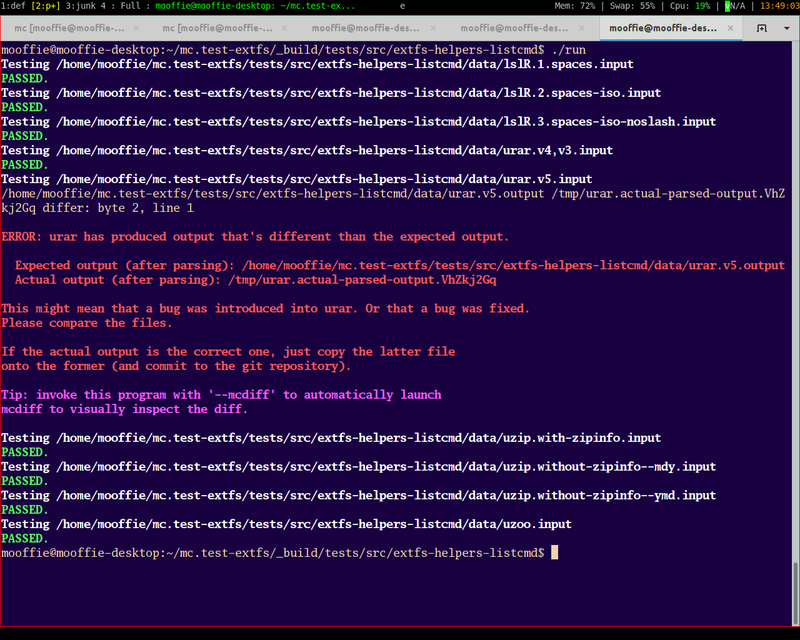 But note that you named the folder simply "helpers", which doesn't reflect the fact that the tester tests only the 'list' command (and not copyin/copyout, as they're very different in nature (and requirements)). Shouldn't we rename it to, say, "helpers-listcmd"? You ignoring my comments is the least of my fears ;-) in fact, I'd be happy to have it merged as is, because we can always improve on it later, and it already solves a very important problem that has been annoying us for a long time. Re. 2a) sure, I get it, this is why I said it was amazing work in the first place. Re. 2b) I quickly glanced through your runner and it *felt* like it was many screenfuls of code (which may very well be an inflated impression), some usual custom ANSI coloring thing (which I suspect doesn't check whether it's being run interactively or not), etc., and this led me to wondering whether we could re-use more stuff from Autotools to keep it slimmer. In any case, as I said, my concerns with custom harnesses is that they usually don't implement any kind of machine parseable output (simplest of all being TAP), and they quickly grow out of control as one starts adding more fancy stuff like parallel execution, incremental testing, etc. Re. 1), I absolutely agree that test autodiscovery is awesome, but I was thinking in terms of using a configure substitution to provide the list of tests to Autotools automatically, instead of hiding all the tests from its harness behind one single custom runner. I understand that the annoying downside is that you'd have to reconfigure if you plug in a new test (even though this can be automated I guess? ), but the advantage is that you can use Autotools parallel test harness, TAP support, etc. It would be great if you could look into this approach before we dismiss it, even if you'll conclude that we should like to keep the current system as you proposed it, and extend it as needed. To try to clarify once again my line of thinking, I think that currently one very annoying thing about our test suite is that the output is not grokable. Imagine we had an awesome dashboard summary after running make check, that would have made assessing the situation much easier. To generate such a dashboard we need granular machine-parseable output, like TAP or JUnit. The unit test framework we use, check, can do it, but we are not taking advantage of it. There is a TAP driver for Autotools as well (same here). Now, if you throw in more custom harnesses, that's not making it any easier. Now, there is stuff like the blood chilling FISH scripts, and if we ever come up with something to test those, this will be yet another harness, etc. Btw, finally got to push the patches for #2707 that I have cleaned up some time ago. Unfortunately, it's listing function doesn't seem to be easily amenable to testing. Another data point to look at... in the mean time, maybe we should merge #2707 in anyways. If I change the tester now it will need to undergo a review process that will take time. It's much more urgent to have these tests in place already. The tester is good enough to be committed as-is. I haven't dismissed it. It's just that I couldn't yet come up with a way to auto-configure this stuff. In fact, I wouldn't mind getting rid of this autodiscovery feature if the price was adding just two or three words per test to the Makefile. I'll be looking into this possibility too. I think it would be great if you could also add TAP output. @Andrew: I just need to know if you want to settle on "helpers" for the directory name, or want to change it (let me know the new name). I need this information so I can post the patches I have for #3729. @Andrew: I just need to know if you want to settle on "helpers" for the directory name, or want to change it (let me know the new name). I renamed "helpers" to "helpers-list". syntax error at /home/travis/build/MidnightCommander/mc/distrib/mc-4.8.18-127-g455316b/build-all-disabled/src/vfs/extfs/helpers/uzip line 22, near ": ;"
BEGIN not safe after errors--compilation aborted at /home/travis/build/MidnightCommander/mc/distrib/mc-4.8.18-127-g455316b/build-all-disabled/src/vfs/extfs/helpers/uzip line 414. I believe that they shouldn't require the tools to be installed in the build environment, what do you think? syntax error at .../build-all-disabled/src/vfs/extfs/helpers/uzip line 22, near ": ;"
You disabled the extfs VFS, it seems (please confirm). So @HAVE_ZIPINFO@, which is used in 'uzip.in', doesn't get defined by the 'configure' script. This results in invalid Perl syntax in 'uzip'. IIUC, what we need is for "make check" to not run the extfs tester at all if the extfs VFS is disabled. Please confirm my conclusion. I'll provide a patch soon. You disabled the extfs VFS, it seems (please confirm). IIUC, what we need is for "make check" to not run the extfs tester at all if the extfs VFS is disabled. Please confirm my conclusion. I think that this is a reasonable approach: one shouldn't test explicitly disabled components. I think that you should chill out a little bit and worry less. We are not as heinous of perpetrators as it might appear... :-) Christmas time is coming and all is good. @mooffie, also, it now occurred to me, that we still have to list test data in EXTRA_DIST, so maybe one could just as well put test names in a variable, re-arrange them to live in each individual subdirectory, specify them in TESTS and use same variable for EXTRA_DIST. Or else, simply add the data directory as a whole to EXTRA_DIST. It just feels somehow wrong to me to argue for test autodiscovery to avoid listing test names in TESTS and then still have to register every single test file individually with the build system.